Oil wealth, a favorable location and buoyant economic growth have thrust Azerbaijan, Armenia and Georgia onto the international stage. However, regional conflicts, political tensions and corruption are never far away. “The Azeris are coming,” shouted a British headline in December 2012 as news broke that sovereign wealth fund Sofaz (the State Oil Fund of Azerbaijan) was buying a £180 million office block in the heart of London’s West End. The purchase—the first in a planned £1 billion buying spree of high-end European commercial property—marks an unusual step for Sofaz, which with $42 billion under management has favored low-key investments in bonds and equities. Oil wealth and the confidence that comes with it bolstered Azerbaijan’s image in 2012, as Baku, which has been transformed by new hotels and other properties, hosted the Eurovision Song Contest last May and prepares for the first time to host the European Olympic Games in 2015, to be attended by some 49 countries. However, Azerbaijan, like its south Caucasus neighbors Armenia and Georgia, finds itself at a crossroads. Presidential elections are scheduled in all three countries this year against a background of economic uncertainty, huge income inequalities, continuing regional problems and corruption. All must maintain growth and investment at a time of slowing global growth, while also continuing with much needed economic, judicial and other reforms. Relations between Baku and Yerevan in Armenia are at their worst since the end of the conflict over Nagorno-Karabakh in 1994, owing to Hungary’s having released to Baku a former Azeri soldier imprisoned for murdering an Armenian soldier in 2004 at a NATO school in Budapest. Reflecting national outrage at the man’s subsequent release and pardon, Armenia’s president, Serzh Sarkisian, says he is ready for war. Although most observers rule out full-scale conflict, border skirmishes are more frequent. “All three countries are undergoing transformation and reform at different speeds but with the added complication of being hostage to frozen conflicts,” says Amanda Paul, Caucasus specialist at the Brussels think tank the European Policy Center (EPC), referring to trouble spots Nagorno-Karabakh, South Ossetia and Abkhazia. So where does this leave investors? The region’s advantages—its situation between Europe, Asia and the Middle East and Russia, its well-educated, inexpensive workforce, financial stability, buoyant economic growth plus a genuine desire by Armenia and Georgia to attract FDI—need to be weighed against its disadvantages—unpredictability, regional tension, lack of transparency and corruption. Azerbaijan is the reform laggard despite, some would say, the enormous energy wealth that has allowed it to run a budget surplus of almost 10% of GDP and embark on ambitious construction projects, including a new $1 billion port 40 miles south of Baku. The economy, like the political system, remains highly centralized under president Ilham Aliyev, who this year will celebrate 10 years in office and who is seen as a shoo-in for the presidency again in October’s elections. However, Baku is mindful that although it remains dependent on oil earnings, its energy supplies are finite. 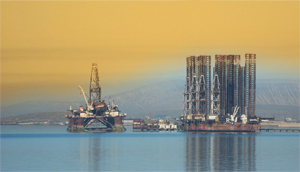 Although the enormous offshore Shah Deniz 2 gas field will come onstream later this decade, oil production is in decline. In October, Aliyev castigated BP, Azerbaijan’s leading energy partner, for underinvestment that, he says, lost the country $8 billion in oil revenue over the past few years; production has consistently been below BP’s projections, a reflection also of the inevitable diminishing returns yielded by some of the world’s oldest oilfields. Negotiations over World Trade Organization accession and a European Union Association Agreement remain priorities, but observers say Baku must also press ahead with reforms and diversification. “There’s been a lot of talk but in truth not much action,” says Alex Brideau, Caucasus analyst for the Eurasia Group in Washington DC. Alex Pivovarsky of the European Bank for Reconstruction and Development is more upbeat, noting that the non-oil sector of the economy grew about 8% in 2012, boosted by public expenditure. But rebalancing, he says, is key. “Diversification into promising areas such as construction materials, agribusiness and small manufacturing, where there is lots of capacity, must continue,” he says. Armenia, perhaps unexpectedly, emerged as something of a reform star last year, as reflected by its strong showing in the World Bank’s Doing Business survey. It moved up 18 points to 32nd place out of 185. The poorest of the three countries — landlocked (many of its exports go via Iran), with no relations with its two key neighbors (Azerbaijan and Turkey) and dependent on Russian support and remittances from Armenians abroad — Armenia seems at last to have woken up to the challenges it faces. Although growth has been encouraging in recent years, Armenia’s economy has yet to make good the 14.1% contraction it experienced in 2009, with alternating growth a perennial problem. Since last year’s elections, the government has significantly improved the business environment and accelerated negotiations with the EU. “Yerevan is hoping to sign an Association Agreement with Brussels by the end of this year. If it does, it will have achieved this within 18 months, impressive for a country many had once written off as something of a black hole,” says Paul of the EPC. One of the biggest challenges, though, remains the high transaction costs of trade, a consequence both of its geographic location and the fact that it cannot use Azeri or Turkish ports. For their part, Georgians are still coming to terms with last October’s parliamentary elections, which saw president Mikheil Saakashvili’s United National Movement unexpectedly beaten by the Georgian Dream–Democratic Georgia coalition headed by billionaire—and now prime minister—Bidzina Ivanishvili. Observers rightly heralded the peaceful post-election transfer of power, the first in the region, but considerable uncertainty remains in a country where everything is political, yet where power sharing and compromise are unfamiliar concepts. For investors, the big question in Georgia is whether the governing coalition—a disparate one united only by opposition to Saakashvili—will maintain the impressive momentum that has taken Georgia into the World Bank’s top 10 countries for doing business. Although the administration is still young, concerns have been raised that Ivanishvili is most concerned with redressing perceived past wrongs and prosecuting former government figures. 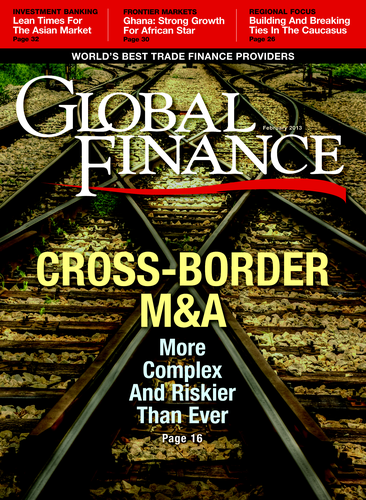 “This government’s economic goals—fiscal conservatism and attracting FDI—are similar to the last [one’s], but the risk is that political battles derail them, because they get distracted or because the president vetoes legislation,” says Brideau of Eurasia Group. One area where the new government could make progress is improving Georgia’s dismal relations with Russia. However, the first official post-election meeting between the two sides yielded little. So the priorities seem pretty clear: continued diversification for Azerbaijan, continued liberalization for Armenia and maintaining stability in Georgia after October’s elections. Yet all three also need to focus on their financial sectors, which have so far played a negligible role in encouraging growth. The recapitalization of the dominant, state-owned International Bank of Azerbaijan was a success, and although there is little progress in its planned privatization, the authorities plan to move ahead with consolidation to enable other players to compete with it. In Armenia local enterprises and banks can now issue foreign currency bonds with the long-term aim of supporting the issuance of local currency bonds. In Georgia the Partnership Fund commenced operation last year with a remit to support commercial projects in priority sectors, but the focus is also on boosting competition within the banking sector.